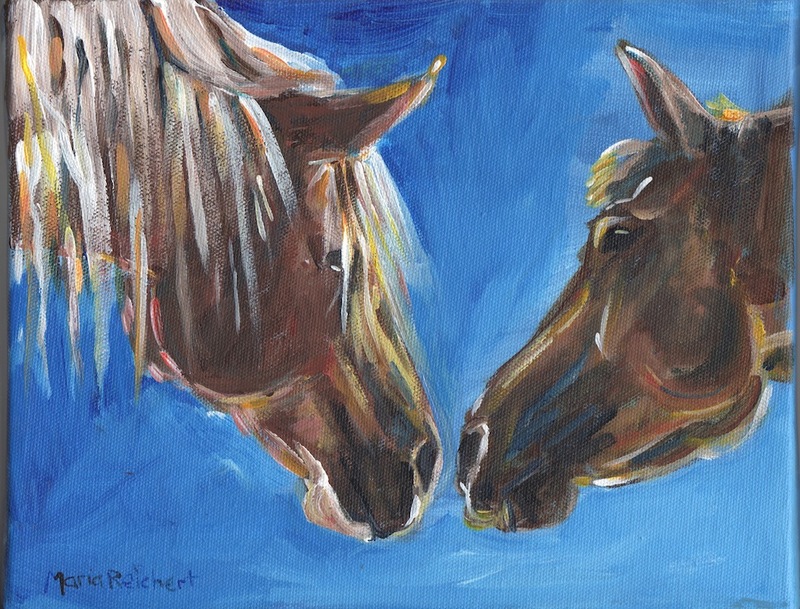 "Tell me, I'll Listen", the reference photo for this painting is used with permission from the website of Equine Voices Rescue and Sanctuary. A portion of the proceeds for the sale of this will go to their rescue group. Loved the lighting of this photo and the long white mane of the horse on the left. Wanted to try to capture the scene with acrylic paints. Simplified the background of the photo to focus on the communication between the horses. Nose to nose, so much to be said. Hmmm, Maria...from the look in their eyes it looks like a conspiracy to me. :) Wonderful! Oh Maria! I absolutely ADORE this!! It is stunning. Just wonderful work. :) Sucha story and you've painted it with such emotion. Lovely. This is wonderful Maria, I love the angle that we are looking at them! Very neat! I love the light too! Beautiful painting! Thank you everyone! 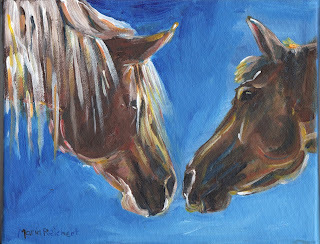 I am working on another horse portrait for the daily paintworks challenge on value, than something else....I look forward so much to your comments. The blue background is stunning and I love the backlighting's affect on the mane. Thanks Margaret, it sure is fun to play with the bright colors! Acrylic is so different than the watercolor, the colors don't fade as they dry, they stay so clear and bright! Beautiful, Maria. Such a sweet moment that you have captured. It's beautiful and it really captures that 'thing' horses have. I'd love to know what they're saying.